The semi set engagement rings in this section are for center mounted gemstones that are between 3mm (.10 carat) and 5.4mm (.62 carat) in size and weight. Special note: it is more important to know the millimeter diameter of your stone for a proper fit than the carat weight. 43 Items. Showing Items 1 thru 15. Fits a 5.0mm gemstone or .50 carat round diamond with 6) 2.0 to 2.2mm accents (center stone not included in price but available as an optional purchase). The sides of this setting have an intricately embossed flower and foliate pattern. Cast per order and available in 10k, 14k, 18k, palladium & platinum. Fits an 5.0mm round shaped stone (stone not included in price but available as an optional purchase). Accented with 10) .01 carat micro pave set diamonds. Cast per order using and available in 10k,14k, 18k, Palladium & platinum. Fits a 5.0mm gemstone or .50 carat round diamond with 6) 1.3mm accents (center stone not included in price but available as an optional purchase). Cast per order using molds of actual antique rings or original hand carved dies and available in 10k, 14k, 18k, palladium & platinum. This genuine sapphire accented semi set ring setting takes (3) 3.5 round stones or (3) approx. .17 carat diamonds (center stones available as an optional purchase). 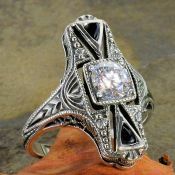 An embossed Art Deco reproduction semi set ring that takes (3) 3.5mm round shaped stones or .17 carat diamonds. Accented with .50cttw cubic zirconia in trillion and square shapes (center stones available as an optional purchase). 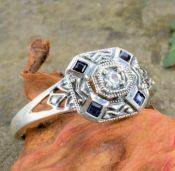 This is a fabulous embossed Art Deco reproduction semi set ring fits three 3.0mm round gemstones with genuine sapphire accents (center stones available as an optional purchase). 5.0 to 5.5mm semi set engagement ring for a .50 carat round diamond (center stone not included) with .30cttw of baguette sapphires and .50cttw of diamond accents. Optional matching band. 5.0mm semi set engagement ring for a .50 carat round diamond (center stone not included) is set with .25 cttw of diamond accents. Optional matching wedding band.